From that, I offered/asked Beth Costa, Henley’s principal, to write a story about the pickup changes. She obliged, and I’m thankful. “Back in the fall, several weeks after school began, I received an email from a concerned parent who picks up and drops off her child at Henley each day. She indicated that she felt the parking pattern was unsafe, cars were driving too fast, and students were walking/running in between cars in an effort to find their parents. To be honest, I had spent my afternoons out with the buses, so I not yet observed the pick-up process. After her email, I spent a couple of days out front and could see clearly that we had a problem. We have many parents who pick-up their children in the afternoon, particularly on days when there is sports practice and not enough room in our current traffic pattern to support the safety of all students. I called Jim Foley, the Director of Transportation and he came out to observe and do a traffic study. He interviewed the sheriff’s office and began measuring areas where traffic seemed to stack up or become jammed. In the meantime, I began communicating with parents about pulling through the pick-up loop, designating an area in the parking lot to meet their children, and being more patient with each other as we work through the “study” element of this process and propose changes. Parents were extremely cooperative and patient; pick up improved almost immediately. 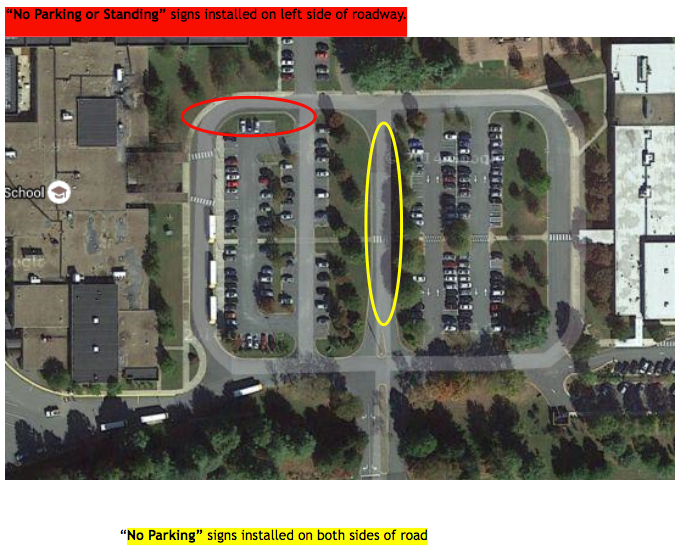 From there Jim proposed that we do not allow parking in two heavily traveled roads (see the attached map). He contacted VDOT who owns the road and had them come take a look. From there he ordered NO PARKING signs. While the signs would take a couple of weeks, we communicated over the holiday break where we would no longer allow parking and offered alternatives, such as the Brownsville loop in front of the school. The first couple of days back from break, we went out early to help support the new parking pattern and the signs arrived on Tuesday, 12 January. Parents have been overwhelmingly supportive throughout and the feedback about improved safety for students is positive. The Albemarle Sheriff’s Office has also done an outstanding job synchronizing the exit from Henley onto Rt 250. With the exception of cars who arrive after 4:10, we can get parents out of the parking lots before the buses pull out at 4:15. It took a strong partnership with multiple stakeholder groups, and we now have a much improved and much safer dismissal. Jim’s note: I wonder how many of those kids could walk or ride bikes to/from school … or ride the bus. Yum! I’m one of those adults that secretly loves hot dogs. The more toppings the better. I bet this was a real crowd pleaser. Happy birthday to your son! I used to be suggested this blog by my cousin. I am no longer positive whether this put up is written through him as no one else understand such detailed approximately my difficulty. You’re incredible! Thank you!